When the scales are not kind to you! So, from 1 January I have been trying to shift a stone in weight, which I had put on last year. I decided, as well as getting back fully into my healthy eating, I would also do dry January. Anyone who knows me, will know that I love my wine. Especially Slim Wine, and in particular their sparkling wine! So when I suggested I would do dry January, everyone laughed, and said there was no way I would do it! Now if you know me, you never say things like that to me, because if you do, I will make sure I prove you wrong! 27 days into January, I am still going strong. Even an opened bottle of fizz in my fridge has not bothered me! I honestly thought that not drinking alcohol would really help me lose that stone quickly! The plan was that I could lose 3.5lbs per week for the 4 weeks of January. I started again writing what I was eating each day in my journal. I ensured I planned every meal. I have completely stayed on plan every day. I am allowed 15 syns a day with Slimming World, but gave myself a 12 syn allowance each day. Most days I have had less that 3 syns a day! Everything was in place for a fantastic month. The first week I lost 3.5lbs Woo hoo. I then went down with the flu. This meant, that I went from planning to go to the gym 4 times a week and doing 17,000 steps a day, to doing only about 1500 steps! On top of that, my asthma flared up! After a visit to the doctors, I was given steroids! That week I dreaded the scales, but was over the moon to see another 3.5lbs off! Happy days. After 2 weeks off, I eventually returned to work. I had continued to eat so well, I was sure that now I had increased my walking, I would achieve the 3.5lb again if not more! I was so disappointed when the scales said only 1.5lbs! I could easily have fallen off the wagon, but I didn’t. I have a goal in my head, and I want it more than anything. When I started this journey, I measured myself. Today, I revisited those measurements. I may not have seen the scales moving in my favour, but the inches had. I was so pleased to see 1.75 inches off my bum and an inch off my waist. Sometimes, you also need to look at the non scale victories to see how well you are doing. I have 6 more days on dry January. I have 3 opportunities to go to the gym before month end! I may not be at the target I want on 1 February, but I will certainly be closer to it than I was on 1 January. So what ever you have to lose, whilst it is good to set yourself a goal, don’t give up if you don’t reach it when you planned to! Our bodies are funny things! Sometimes, they take a bit longer to catch up with us. I’m going to hit that target, I know I will. Why? Because I want it! You will never go hungry or thirsty in Krakow! There are absolutely loads of options open to you ! The big decision is, do you want food on the go, in a relaxed or formal setting, inside or outside ! When we go away, we like to eat local food. You will find a MacDonalds everywhere in Krakow, but there is no way you would find us eating there. We can have one of those at home! The weather for us was gorgeous, so it was perfect for sitting outside! We were staying a few minutes from the main square, so we tended to gravitate there! There are many restaurants running around the square. Each have their menus on boards outside, so you can check before committing yourself. Don’t worry if you think the menu is limited in some, they have just put a selection on display! Ask them for a full menu. Most staff speak very good English, so if you have any specific requirements, they are happy to cater for you. On every corner you will find a little stall selling ‘Precels’! These are rings of bread, and delicious, perfect for eating on the go. They come in various toppings, cheese, sesame, spicy and salted. At only 1.8 PLN (approximately 45p) they are a bargain! We had them the day we were running for the train to the Salt Mine, for breakfast, as well as to take to airport when we left! If you want to sit down, don’t be fooled by the price! Most meals are under £10! That doesn’t mean the portion is small! Oh no! This is one of my dinners ! It was a starter but I had it as my main! That is a litre of beer next to it! It was filled with a selection of meats including, chicken, pork, Polish sausages and beef, with sauerkraut in a dry sauce! It was very filling so the bread wasn’t eaten! Other local dishes include Bigos (hunters stew) which is also served in a bread bowl, smoked sausages, Pierogi(dumplings), which are stuffed with a variety of fillings ranging from cheese, minced meat, cabbage and mushrooms. Don’t forget the good old pork schnitzel too! These are also usually the size of a dinner plate! And one of my hubby’s favourite, the pork knuckle! Be careful when you choose this option as some are a set price, others are charged per Kilo! This is the one my hubby ordered! It was 1.2 kilo ! Way too much for 1 person! Every meal is served with bread, but rarely butter. If you want it, ask. I’m sure most restaurants would be happy to provide you with some! What was lacking for me though was the lack of vegetables. Some dishes came with potatoes but that is all. You will need to order vegetables and salad as an extra! My tip would be to order your drinks, look at the menu, and then look what others have had ! It will give you an idea of how it’s served, and more importantly, the portion size! You can share a main, or even ask for a doggy bag! If you are visiting the Salt Mine, I would recommend the sausage for lunch ! For 15 PLN, you get a large sausage, bread roll and a bottle of Coke, which is less than £4! It’s delicious! We had most of our meals at the same restaurant. Why? It was sooo good! And the beer was the cheapest we had found ! 17 PLN (£4 ish) got you a litre of their local beer! It was one of the very few without patio heaters, but as we were lucky with the weather it didn’t matter! So what was that restaurant ? Sukiennice! It’s named after the building it’s located in – Cloth Hall! Sukiennice is its Polish name. Breakfast was also the most reasonable we saw! Scrambled eggs (3 eggs) wit bread was only 9 PLN (less than £3), you could them add extras such as bacon, mushrooms, cheese etc for only 1 PLN (25p)! I opted for one of their bagels for breakfast. Beetroot, rocket and walnuts. Oh wow! What a taste delight! At only 9 PLN (just over £2), it was a bargain! Beetroot is a traditional food item of Poland. Most restaurants will have a delicious beetroot soup on its menu, served hot and cold! They had a good selection of tea and coffee too! Because it is on the square, you get to people watch, while eating, which I always enjoy! They also have a cosy basement for late night tipples! Another restaurant I’d recommend is Chopin! It’s on the opposite corner of the square! The head waiter was such a charmer! When I tried to make a joke with my friends that they didn’t serve alcohol, he joined in. He told the group they only sold potato water, grape water and hop water! Aka vodka, wine and beer! I had one of the very few salads here! Roast beef! It was cooked to perfection and at only 23 PLN (less than £6). When in Krakow, I would also recommend a walk to the Jewish quarter. There are also some lovely restaurants there too! I’m sorry but I can’t remember the name of the one we ate in, but wow, it had the best bread I’ve ever eaten! I had had a big lunch, so wanted something light for dinner! I chose a mushroom soup, served in a bread bowl! The soup was good but the bread, out of this world ! If you had the hunters stew here, it also came in the same bread bowl. The bread was firm enough to hold the liquid, but light and flaky to eat! I wish now I’d asked how they made it! I can still taste it today, a week later! On our last day, we had lunch at Max 18 in the square! I had chicken kebab, salad and chips! Again a really large portion of food! What was exciting though, was behind my shoulder, in the next restaurant, they were filming! I asked our waiter what was happening. It was a scene for a local Soap Opera! I didn’t recognise the main man, but still, it made for an interesting lunch ! I’m usually a wine drinker, however it’s a bit more expensive in Poland, so I stuck to the beer! Local beers are really easy to drink. Price ranged from 10 PLN for half a litre, to 17 PLN for a litre at Sukiennice Restaurant. So basically £2.50 to £4.00. The two we mainly drank were Tyskie and Zywiec. When in Krakow, it would be rude not to try their specialty! Vodka! At home, I love toffee vodka, but here, I would strongly recommend the cherry and hazelnut. If you like Ferrero Rocher, you will love the hazelnut one in particular! Its like a liquid version of it! It was so nice, I had to buy some at the airport to bring home! At only 16 PLN a bottle (£4), it would have been a crime not to! All restaurants will offer a range of soft drinks too. The homemade lemonade is also a really good choice, if you don’t want anything alcoholic. You don’t get tap water on the table, so if you do want water, you will need to pay for it. When you pay the bill, they will also give you a little shot of cherry liqueur, which is really really nice! It certainly leaves you wanting a second! Krakow is definitely a place worth a visit. Make sure you try eating and drinking local specialties. You won’t be disappointed! Is the current heatwave effecting your weight loss? Its too hot to exercise? Ok this is partly true? I have 2 dogs as you know. I would normally walk them twice a day. They are still getting their morning walk, but with temperatures at around 28/29 degrees when we get home at night, its not fair to take them out. The way I look at it is, would you walk bare foot for an hour in a fur coat that time of night? The answer is no! Firstly, you would just die from the heat in the fur coat, and secondly, the sun has heated up the tarmac all day. You would burn your feet if you tried to walk on it without shoes. Dogs are the same. Their paws would burn very quickly. Instead we allow them to run around the garden. As for the gym, well yes its air conditioned but they don’t seem to have it turned up enough! In my house that means having a plate of nibbles while the fire is heating up, and a cold drink of wine for me and beer for my hubby? Do you have salad dressings that are high in calories, garlic bread, white rolls too? Of course we do! Why be inside when I could sit outside? So I have a choice, the housework or sitting in the sun, in the garden with a book? Yep, I’m going for the sun everytime! I mean, we only have it a few months of the year don’t we! Its such a nice day, why don’t we got to the pub on the way home for a quick one? Isn’t it funny that as soon as the sun comes out, sitting in a beer garden suddenly seems so appealing. And its only the one drink. Then you come home and think you may as well sit in the garden and have another! Lets invite friends around for a garden party? Its such an opportunity to get your friends round for some drinks and nibbles. We can all sit in the garden chatting. Dipping our hands into a selection of nibbles and not really knowing what we are doing! Then there is the alcohol! Its so nice, I could just have an icecream to cool me down! Well it would be rude not too wouldn’t it! My hubby and I have been doing all of the above to some degree lately! We were on holiday recently in Scotland, the weather was warm but not like it is now. We still enjoyed a couple of drinks in the evening, but managed to come back 1.5lbs lighter! On Monday I got on the scales and am now another 5lb heavier in 2 weeks. So what is the difference? I really had to think about this question! The truth is the difference was me! Its nothing to do with the weather, it is my own attitude and motivation! I wanted to make sure I did the most steps I could each day, so made sure we chose activities that meant we did a lot of walking. If it was warm, we took the dogs on routes on grass and near water so they could cool off. I also realised there wasn’t an excuse not to go to the gym! Yes it was a bit warm, but I just needed to make sure I drank plenty of water. I also didn’t push myself as hard if I was getting too hot! It’s better to do something than nothing! I planned my food better! I always put a packed lunch in our cool bag each day. I planned when I was going to need bread, so that I could have my HEB of a wholemeal roll rather than a white one! I knew each day what I was eating and when. I always filled up on the right things so I wasn’t tempted. If hubby wanted an icecream, I had a diet coke! I thought about my treats. I would save them for the evenings in case I wanted that snack. If I did, I measured it out! I also made sure there were healthy option of treats, and not many bad ones. If I didn’t have them, I couldn’t eat them! I put plenty of fruit in too! I kept to my Slimline Wine. Its less calories than normal wine. I also love it, so rather than drink it quickly, I’d relax and enjoy it. It is only 410 calories a bottle, comes in white, red, white sparkling and red sparkling. The sparkling ones are equal to any champagne you will drink! Its only available online at the moment, but well worth it. Check out their website https://www.youtube.com/watch?v=ePncnDheAGk&t=1s . It’s also sugar and carb free and suitable for vegans! Another bonus is that due to the low sulphur, you don’t get a hangover ! If I was really thirsty I would have a sugar free soft drink first! You will be surprised how much that makes a difference! If we did go to the pub, what is wrong with a soft drink? If you really want a glass of wine, order a small not a large! You don’t need to stop seeing your friends, just think about it! If you don’t know what is being served, eat before you go out. If you are already full, you are less likely to pick! If you are doing the entertaining perfect! Fill the table with healthy options, such a raw vegetables, homemade vegetable crisps etc. Cherry tomatoes are good for picking at! Look online and be creative! Pizza made from Weight Watchers wraps are really good and if you plan it in, it could be your HEB too. If you want garlic bread, again you can make this yourself using your HEB, Garlic Frylight and lazy garlic! Make sure you have lots of healthy salads available, as well as salad dressings. Balsamic, lemon and vinaigrette dressings are perfect! Don’t forget to remove the skin from the chicken! See how much fat is in the skin on my Youtube channel – https://www.youtube.com/watch?v=ePncnDheAGk&t=1s – you will be surprised! When it comes to the desserts, avoid high calorie ones. Fruit salads, recipe on my website for a mousse is delicious. Check out http://www.slimminginspirations4u.com. Ultimately, the only thing that is impacting on your weight loss is you! When you stop and really think about it, there are some easy things you can do to put it right. So what are you waiting for? I’ve now given myself a good talking to, so am hoping to get those pounds back off! Is it time to open the bubbly ? How many of you wait for a special occasion to pop open that special bottle of bubbly ? Champagne has always been thought of as the go to drink when you have something to celebrate! The more you spend on the bottle, the more it seems you have to celebrate ! Champagne varies hugely in cost and taste, starting at around £14 for a supermarket h,ome brand to £48 for your Bollinger! We all know though that the price tag doesn’t always reflect the taste! Some of us like it sweet and some like it dry! At £48 that’s a lot of money to spend on something you later realise you don’t like ! Price also means that you may hold back on celebrations. I mean what counts as a big celebration? What if you could find a champagne that was excellent value for money and tasted amazing? Well you can ! Ok it won’t be called champagne, but as you know the name is the region, not the quality or taste! 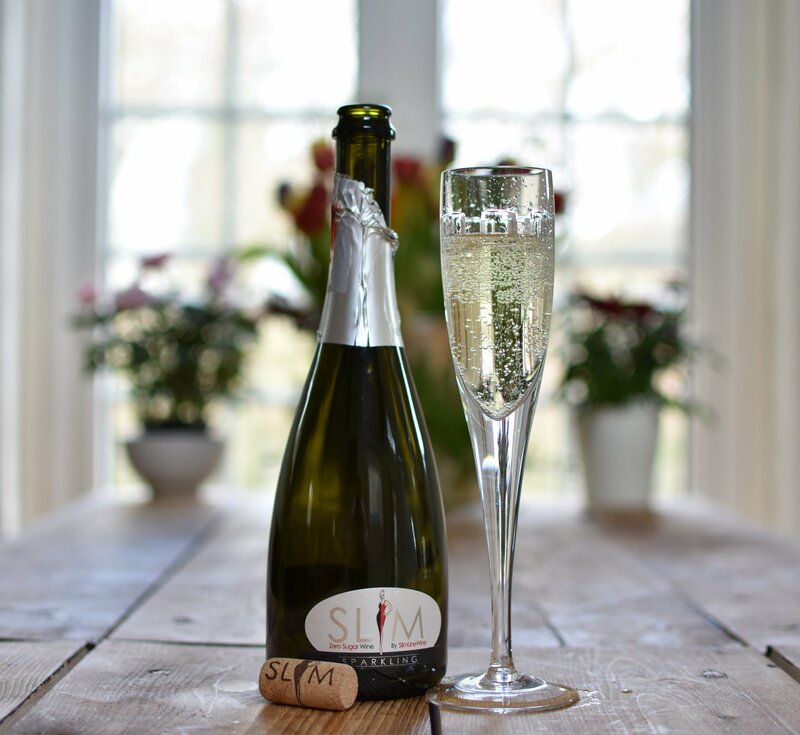 Slimline wine now have 2 sparkling wines, that will give any bottle of champagne a run for its money at a fraction of the price ! All the Slimline wines are produced in Calamandrana in the Piedmont region of Italy and therefore can’t carry the Champagne name! But wants in a name ? You don’t buy a car without checking under the bonnet! If you like a sweeter taste this is your baby ! Made from a blend of Chardonnay, Pinot Noir, Pinot Grigio and Barbera it’s fruitier that the white . It’s like no other pink champagne on the market ! Both wines are gluten free, sugar free, carb free, suitable for vegans, and due to the reduced sulphur doesn’t give you a hangover ! I can certainly vouch for that! The whole bottle is only 410 calories so perfect if you are watching your weight! Less than 2 weeks ago, I was one of the lucky people given the opportunity to see where and how these wines were made. I also tasted a lot of bottles (for research purposes of course!). Both bottles are equally as good, but for me the new white is the new Bollinger! I am no longer going to be spending almost £50 for a celebration! Its Slimline sparkling all the way! What’s more, because of the price, I don’t have to wait for a really big celebration to share it with family and friends. In fact every weekend is now a celebration! Both are currently on offer for £9.99 a bottle. It’s currently only available on-line but if you buy 6 bottles , use SLIM offer code and get free delivery ! Why not give yourself more reasons to celebrate! At this price you can pop that cork more often! Summer is here, the BBQ’s will be coming out. You will be having garden parties, birthday, weddings, christenings, or just because events. Make sure Slimline sparkling is a feature of them. It will make your event go off with a sparkle! It is also very versatile for cocktails. Visit them on Facebook to see some of the many suggestions. Slimline also do a cracking White and Red which I highly recommend. We all know the expression – do you remember where you were when President Kennedy was shot? Well I certainly remember where I was when I heard I was one of the lucky few invited by Slimline Wine, to see where and how their amazing wine was produced! The date was 5 March 2018 in the Novotel Hotel in Leeds! A few weeks before, Slimline had announced 5 lucky winners who were going to be taken on a trip of a lifetime to Italy. I waited in anticipation as the names were called out! I was away with work in Darlington, so was sat on my bed praying it would be me! As the names came out one by one, Stu, Jac, Gaynor, Lisa and Sue, my heart sank. I was pleased for the winners but disappointed for me. I still loved the wine and believed in the company, so continued to follow and support them. They had now started doing a cooking show live of Facebook with Chef Andy. I loved this as it paired the wine up with some amazing meals. I would set my alarm on my phone each week to make sure I tuned in. I was away with work again on 5 March. The Wi-Fi in my room was breaking up, so I was having difficulty in getting to watch that weeks cooking show properly. Eventually I managed to watch it back on catch up. To my complete surprise and joy, Miriam announced live that they wanted me to go too. If I said I was excited I would be underestimating how I felt! A group chat was set up with all the winners, and over the next few weeks we would message each other daily. We were a group of strangers with one important thing in common. We all loved Slimline Wine! We were all given the option to bring along a plus 1 on the trip. Sadly 1 of the group couldn’t make it. Another winner, Julia, though was added to the happy band of Slimline friends. On Friday 15 June 2018 11 complete strangers met at Gatwick Airport along with 2 of Slimline Wines staff – Matthew Tanner and Simon Palmer. The only thing in common was the wine. We could absolutely hate each other or become lifelong friends! One by one we arrived and introduced ourselves to each other. Straight away there was an ease about us all. It was like we had known each other for years! We had time in the airport so took the opportunity of visiting the shops, before having a drink in the bar together. We all boarded our 1 hour 45 minute flight, and travelled the 546 miles to Turin Airport. There, we boarded a large minibus and embarked on the 1 hour 30 minute drive to our Hotel in Calamandrana – the home of Slimline Wine. Our hotel – Le Corte was absolutely beautiful. An old farm house, it oozed rustic charm. As I stepped off the bus, the views took my breath away! We walked into the courtyard to be greeted by a voice in the distance, inviting us to drop our bags off and to have a drink! None of us needed asking twice! The voice was from the one and only Paul Anthony Gidley. The man on the back of the bottle! The man who started the company and after a conversation with his partner Miriam, came up with the idea of a wine with lower calories. We were greeted by Sam the waiter serving us a Slim Aperol Spritz. I’d never tried this before, but I will certainly be having it again. It’s a mix of Aperol, Slim white fizz and sparkling water. Perfect for a hot Italian evening and so much better than Pimms. This is the new summer drink! This was our first chance to really sit down together as a group and get to know each other. More Slim followed until it was time to check into our rooms and change ready for dinner at 8 pm. Our room was 204, the junior suite. It was absolutely stunning, with amazing views. Dinner was a set menu, with of course Slimline Wine. The restaurant had, just like the whole of the hotel, dramatic views. We watched the sun set over the vineyards whilst sipping our Slimline Wine. The food was really tasty and plenty of it! The staff at the hotel were so friendly. It was like everyone was part of the family. It was a perfect first evening, and by the end of the night (ok early hours of the morning! ), we were all truly good friends! Considering it was a late night, we were all up early the next morning ready to start our tour of Slimline. Well ok, all except one of the group, who had forgotten to move her clock forward! The first stop was the factory where the wine is made and bottled, in Calamandrana. There we met the other important man behind Slimline Wine, Dan Cusmano. (Photo above). Dan gave us a tour of the factory explaining how it was made, from the moment it leaves the vines, to when it is bottled. Over the next few weeks I will be sharing some videos of our tour on my Youtube channel so make sure you subscribe to it, so you don’t miss them! What was evident was the passion both Dan and Paul had for their product. They had spent many months making sure they had the perfect grape, the perfect combination and conditions, to give us what we have today. If any of you have tried the white fizz, you may have experienced problems getting some of the corks out! This was a great opportunity for me to ask Dan about this. He explained that in the early days, the focus was on creating the perfect wine. The cork wasn’t one of the main priorities. On learning our difficulties, they realised they needed to fix this, so new corks were produced. The new ones come out a lot easier! The next stop was one of the vineyards. As you walk through the straight lines of vines, you can feel the love that has gone into planting them and making sure they grow into the perfect grape. The grapes won’t be ready for picking until September. We were invited to go back to help with this. I’d love to do this, however as I already have a holiday booked at this time, I sadly may have to decline this offer! Lunch was at a beautiful family run restaurant in Loazzolo. The views from this place were amazing, as was the food. The lunch consisted of 5 courses! We weren’t expecting that much initially, so filled up on the bread! Big mistake! It was absolutely delicious. No Slimline wine was served, but we did get to try some other white and red wines of the region. Equally as good however with more calories! After 5 courses, a walk was required, so we did a visit to a lovely town called Acqui Terme. In the square there was a fountain where natural hot spring water flowed. It was then time to return to our hotel for quick dip in the pool before dinner! Tonight’s dinner was being held at the home of Dan’s father Raymundo. His villa was just above the hotel. When I thought our views couldn’t be improved on, Raymundo’s balcony blew me away! Raymundo personally cooked us a variety of meats and breads on his BBQ, served with fresh salads from his own garden. It was such a lovely gesture. We were so relaxed and had a great time. This was all washed down with Slimline wine and some great company! We returned to our hotel to have a nightcap or 2, of more Slimline Wine! Today was a going to be a little bit more relaxing! After breakfast, we had a quick wander into the village of Calamandrana before heading off to Canelli. Here, we went on a tour of the wine cellars of Bosco who produce Asti Spumante. At the end of the tour, we got to try 3 of their products. I have to say, whilst I loved the tour, the wines are not a patch on Slimlines! We then retired to a lovely bar in the square waiting for a classical concert to start. Sadly, by the time our transport back arrived, the concert hadn’t started! On our return to the hotel, we headed to the pool. Whilst the boys had a dip, the girls relaxed and enjoyed more slimline wine. A lovely table of cheeses, hams and breads was laid on for us, with yes you guessed it, more Slimline wine. This should have been our last day! Today we headed back to Turin Airport for our return flight home! Unfortunately, due to an accident on route, we were held up in traffic and so we missed our flight home! Were we cross? No! We had had such an amazing time, we were all good friends, it was no-ones fault, so we did the only thing we could do! We worked together to make arrangements for alternative flights home. This ended up being another trip to an airport hotel in Milan, with a flight booked for the next day! That evening, we enjoyed a drink in the hotel bar, before heading off to a local restaurant. It was a lovely evening. We all said our goodbyes and headed home. We had the most amazing time thanks to everyone at Slimline Wine. We wanted for nothing during our time there. Paul, Matthew and Simon were the perfect hosts. Slimline Wine was as amazing as ever, and now I know what has gone into making it, I will be enjoying it even more! If you haven’t tried it yet, please do! Its only online at the moment, but will be coming to a Tesco store near you, very soon. We drank a lot of the wine while we were there! I can promise you, I never woke up with a hangover once! The reduced sulphur is an added bonus! Follow them on Facebook. You never know when they will be having another competition like this one. It really isn’t something you want to miss. 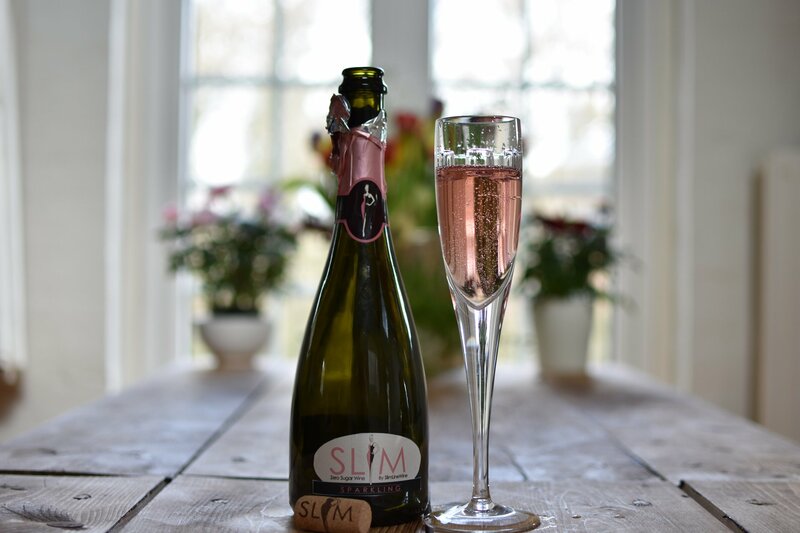 When I started drinking Slimline Wine, I never realised how it would change my life! I can now drink wine that doesn’t give me a hangover, is less calories and has helped me make friends with a great group of people! Slimline is going to keep growing. With smaller bottles planned already, you know there is more to come. Seriously, this is a company to keep a watch out for! Get clicking on their Facebook page, and be one of the first to find out their new products and deals! On Sunday 24 June they are offering our first opportunity to buy their vintage fizz for £9.99 a bottle, with free delivery on 6 bottles ! Having the pleasure of being one of the first to try this in Italy, I would highly recommend it ! Get yours while stocks last ! Much better and cheaper than any champagne you will buy!